The Swarovski earrings collection features a vibrant selection of stylish drop earrings on fish hooks, studs or clip on for non pierced ears. In sterling silver, rose gold and yellow gold plate. These pearl drop earrings with Swarovski crystals are available in so many colours, please see the image of all the Cassio necklaces for full colour range. Start with the deep purple at the top and go round to old gold. If you can't see the right colour for you just email us and we can work with you to create it. Maybe for your bridesmaids gifts to match your wedding colour scheme. The clip on earrings are lever back but have an adjustable screwback so you can get the perfect fit. Matching necklaces are also available. 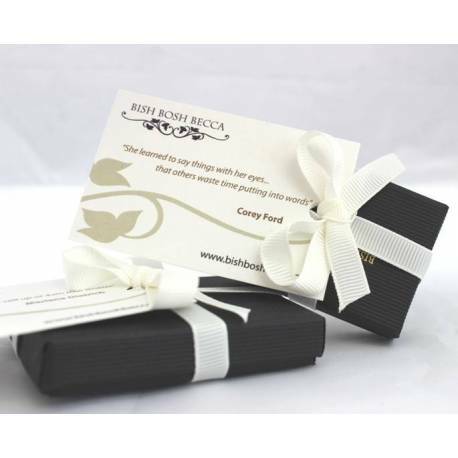 Once we’ve created the perfect earrings for you, we’ll carefully package it in one of our beautiful black gift boxes with a gift card. We’ll then finish it with a flourish of ivory ribbon ready for you to give to the lucky lady. Sterling silver or rose gold plate or gold plate with Swarovski glass pearls and crystals. Clip on earrings are silver plated or gold plated. The pearl at the end of drop is 6mm and the round swarovski crystal is 8mm.